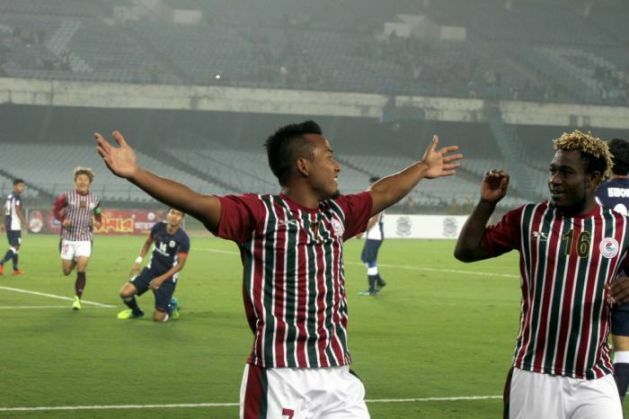 Mohun Bagan created history on Wednesday, 27 January, when they defeated Tampines Rovers of Singapore by a score of 3-1 in the first playoff round of the AFC Champions League, thereby becoming the first Indian side to win a game in the competition. Inspired by Sony Norde and Katsumi Yusa, Bagan put on a thoroughly dominating performance to knock Tampines Rovers out of the tournament. Jeje gave his side the lead early on in the game, and Cornell Glen soon earned a penalty to double his side's lead. Glen missed the spot kick, but managed to scored a few minutes later after some good work by Sony Norde. Rovers pulled a goal back before the end of the first half, but Katsumi Yusa scored in the second half to seal a 3-1 win for his team. However, despite the historic win, the mood in the Bagan camp is not very jolly. The discontentment stems from the fixture congestion that progression to the 2nd playoff round has led to. Ahead of the game against Rovers, Mohun Bagan had requested the All India Football Federation (AIFF) to reschedule the I-League game against DSK Shivajians on 30 January in case the club won against Rovers. With a 2nd round playoff game against China's Shandong Luneng away from home on 2 February, the club felt it was only logical to move the game in Pune to a later date. However, that wasn't to be the case, as AIFF turned down the club's request outright. This means that Bagan will now be forced to play five games in five different cities (Pune, Jinan, Kolkata, Mumbai and Bengaluru) within a span of 15 days. The club is slated to play Shillong Lajong at home on 6 February, followed by Mumbai FC on 10 February and Bengaluru FC on 13 February. Moreover, in case the club does beat Shandong Luneng, Bagan will be forced to play the final playoff game against Adelaide United in Australia on 9 February. Following the win over Tampines Rovers, a furious Sanjoy Sen, head coach of Mohun Bagan, lashed out at AIFF for its inability to support an Indian club hoping to make it to the AFC Champions League group stages. "This is terrible! I thought if we won, our match in Pune against DSK would be postponed. I just heard that AIFF did not hear our words. This is how football is run in India. It's horrible! God knows how this can happen. It's unfortunate for us," Sen said in the post-match press conference. "We have told the officials. (The) AIFF has to see for improvement of football. The Federation has been sold out! They have no standing now. We are going to Pune, then we go to China. If something happens wrong, only I get the blame. No one has the responsibility," he was further quoted as saying by Goal.com. Bagan, who are currently fourth in the I-League standings with 7 points from 3 games, will now travel to Pune for the game against DSK Shivajians.